If you have known us for awhile, you may also know that in addition to always searching out the best of all things musical, we also like to pass along anything of interest that our friends might also enjoy. 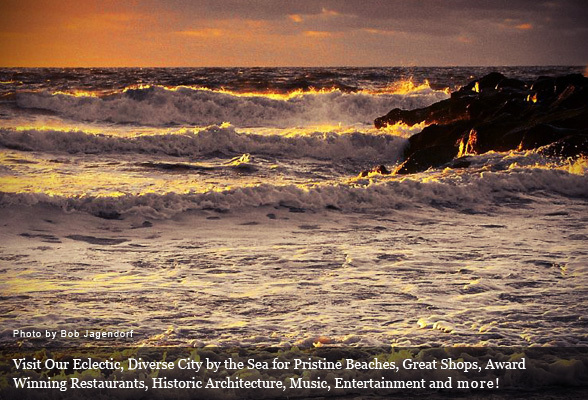 Whether an age old favorite that we have known since our early days growing up along the Route 35 Coastline, or a new gem we have stumbled across in our recent travels, we always like to share what we consider to be the best places and services for others to discover and check out on their own. 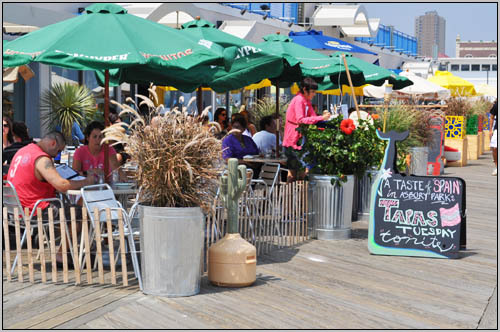 This edition of OBMC Tips will focus on the Jersey Shore Corridor, in particular the areas of Asbury Park, Ocean Grove, Long Branch, and the surrounding areas. 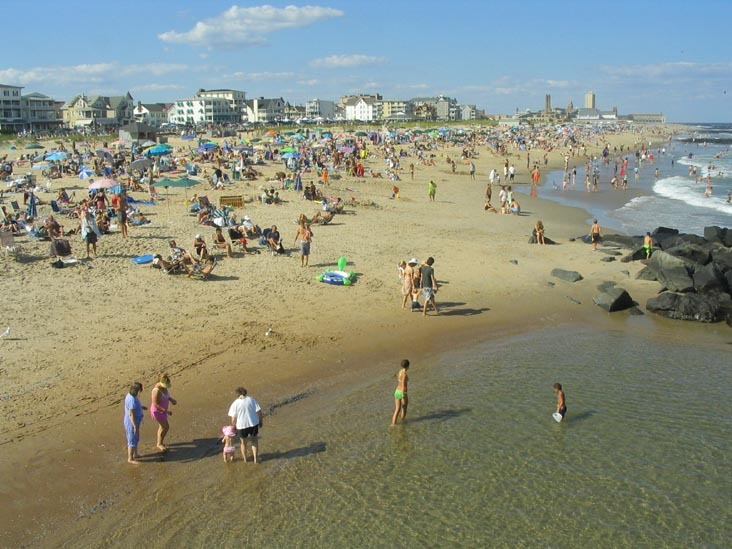 If you are from the Old Bridge area or close by in Middlesex County, you may think that some of the best beaches, restaurants, music and culture, shopping, and diverse things to do found in Asbury Park and surrounding towns are a hectic bumper to bumper parkway traffic ride away, but think again! 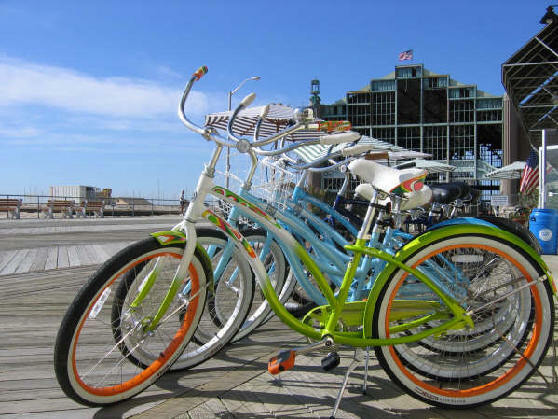 We make it from Old Bridge to the Asbury Park Boardwalk in 35 to 45 minutes most days, without any traffic, tolls, or red lights! How you ask? 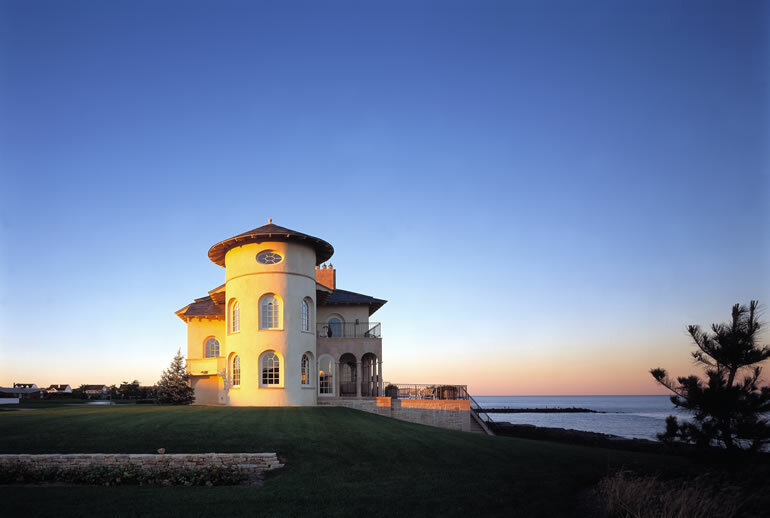 Many of our friends are unaware of this jewel of a road that leads to the Jersey Shore. 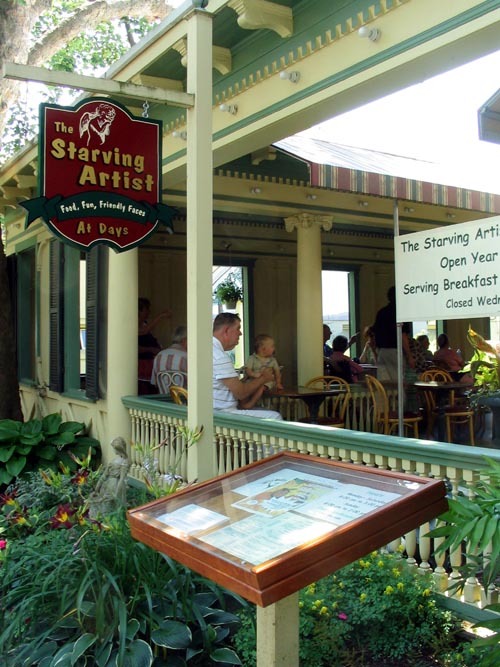 There are two different ways to get to the Asbury area, both easy to navigate, and a nice trip. From the OBMC, (or from Route 516), simply take the exit for Route 9 South, once on Route 9 South, stay in your left lane a mile or two until you see the exit ramp for Route 18 South. 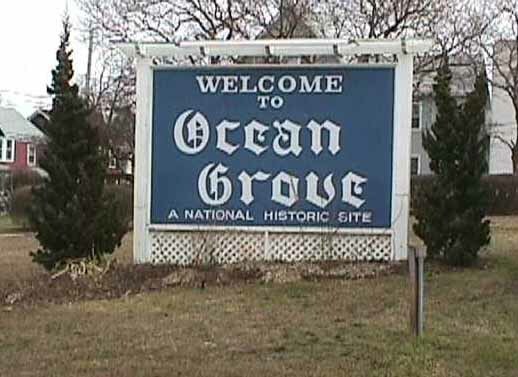 Stay on Route 18 South for approximately 25 miles or so until you see signs for Route 33 East/Ocean Grove, on the right. After exit, take Route 33 East pass Jersey Shore Medical Center, soon the road will end, make a left at the last light, and you will be on Main Street. 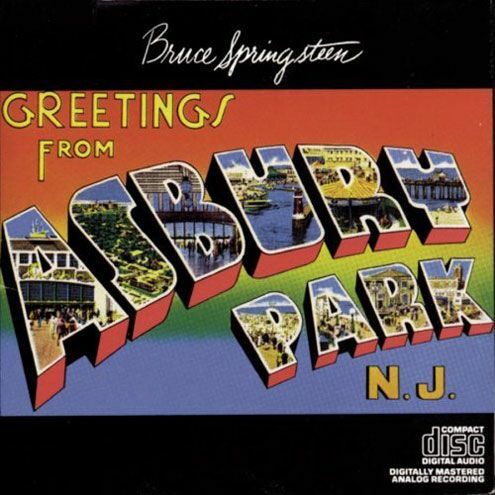 From there make a right on Asbury Avenue, and it will bring you right to the beach and boardwalk. The same directions as above, Route 9 South to Route 18 South, but this time take Route 18 South for 20 some odd miles until you see the exit ramp for Route 35/36 on the left. (This is the same exit that will take you to Monmouth Racetrack, or Monmouth Mall). Once off the ramp you can take either Route 35, or Route 36. We suggest Route 36, (stay to left after exit, which turns into Route 36, headed towards Long Branch). Eventually Route 36 turns into Joline Avenue, which after a few miles ends at Ocean Avenue. Turn Right onto Ocean Avenue. Almost there! 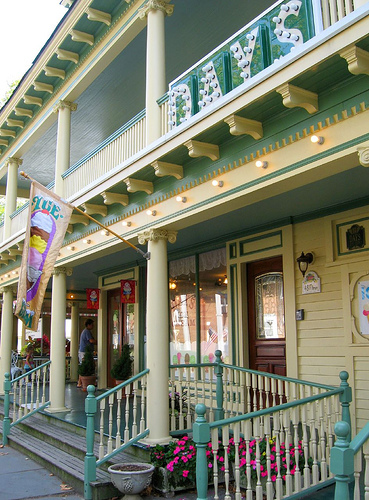 Along the way, you may want to grab a bite to eat, and there are plenty of places to stop and shop. 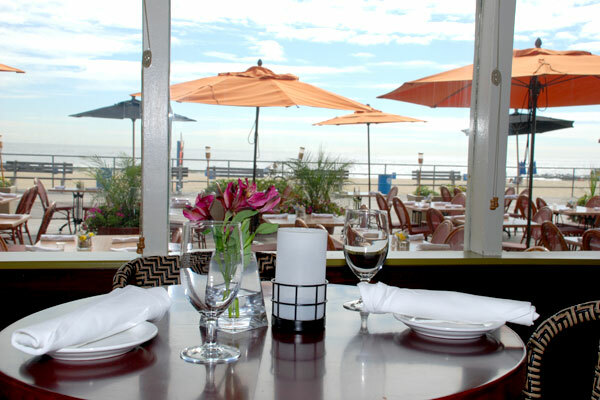 One of the most popular destinations over the past few years is Pier Village in Long Branch, www.piervillage.com boasts some great restaurants, including Sirena- http://sirenaristorante.com/, Mcloone’s Pier House- http://www.mcloones.com/pierhouse/gallery.php and be sure to check out the other Oceanfront restaurants of Mcloone’s on their website, including the Rum Runner in Sea Bright, and the Asbury Grille across from Convention Hall on the Boardwalk). 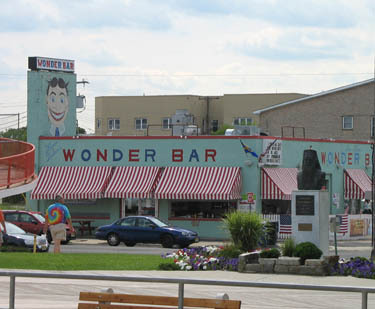 There a variety of other shops and restaurants in Pier Village, as well as some free Summer concerts. 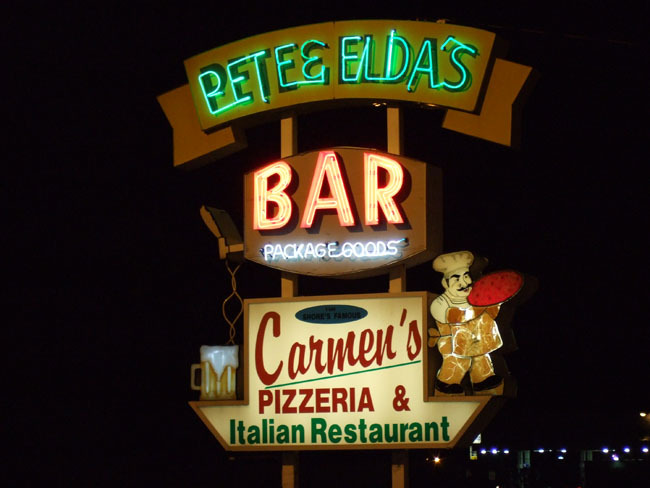 Both are excellent, and countless celebrities, superstars, and well known public figures have made both of these Jersey Shore Legends a must see for years. The staff at The Windmill will be happy to throw your dog on the grill for a little extra flavor, and cook your fries to order if you like them a little crispy- just ask! 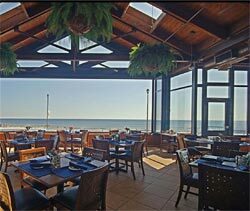 You can also take the stairs and walk up on the roof to eat your meal with some awesome views, and just a great way to take in the Jersey Shore vibe! 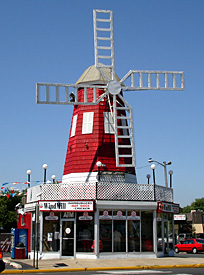 *Footnote- In our experience and opinion, not all Windmill’s are created equal- The Windmill on Ocean Avenue/Brighton Ave in West End/Long Branch is the best by far- Local belief is that is because the grill is the same one from the 60’s, and the flavor is basted in, making the flavor better. 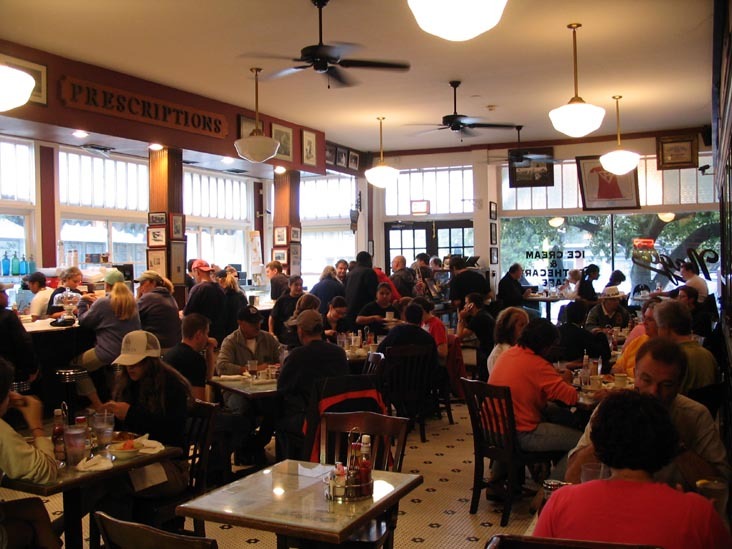 A little down the road, on the opposite side North, walking into Max’s you will also sense the legacy and history of a local legend still delivering some of the best dogs around after 80 (!) years! 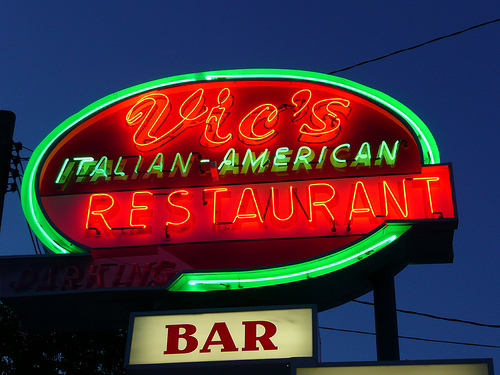 You can’t go wrong with anything you order, so treat yourself to a Jersey legend. 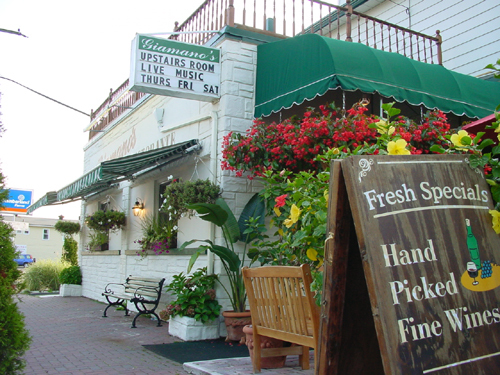 Continuing down Ocean Avenue, as you pass through Deal, you will pass through a small town called Allenhurst/Elberon/Loch Arbor for a minute or two, before coming to the end of the road in front of Deal Lake, which welcomes you to Asbury Park. Make a left to loop around the lake, after a hundred yards or so, you will see Asbury Tower on your left, make a left after the Tower onto Kingsley Avenue. 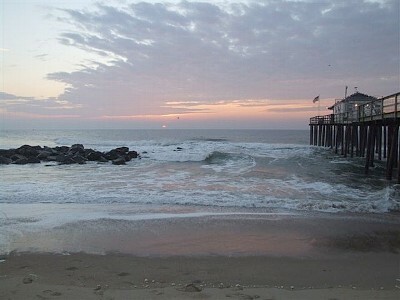 Congratulations you made it to Asbury via the scenic route! 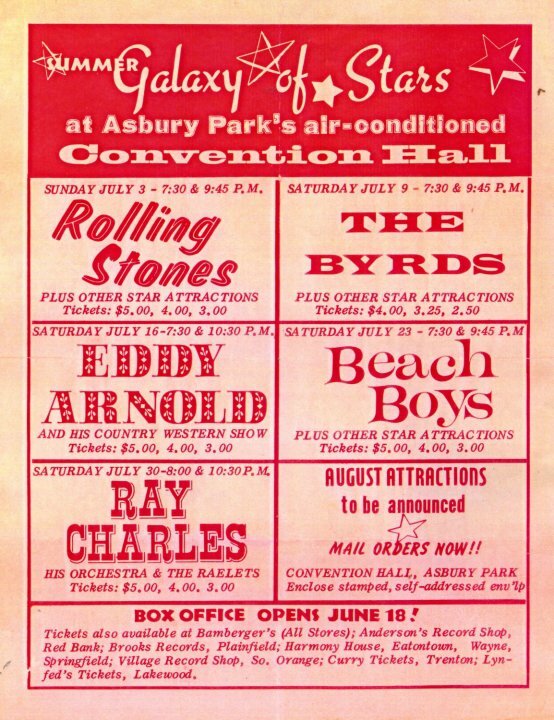 *Footnote- there are other ways to get into Asbury Park, via the Parkway South, or Route 18 South to Route 33. 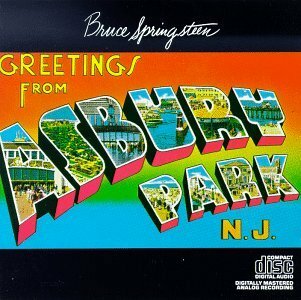 Mapquest, and look for Asbury Avenue to bring you straight to the beachfront. 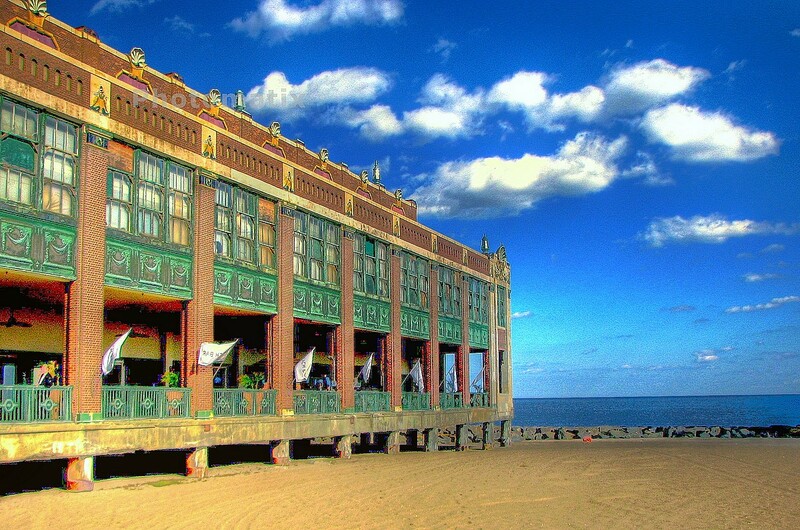 Now that you are in Asbury, you can enjoy the unique oceanfront panorama of things to do, whether a day at the beach, (amazing beaches! 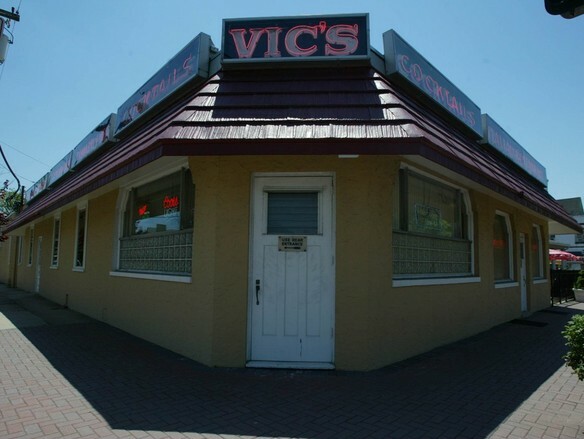 ),boardwalk shops and restaurants, live bands and entertainment, pinball, and just an incredible time at our favorite Jersey Shore destination. *Footnote- Asbury has paid parking meters until 9:00 pm, which are strictly enforced, so be sure to find a meter to pay, or we recommend going to one of the bigger lots, where an attendant will be waiting. 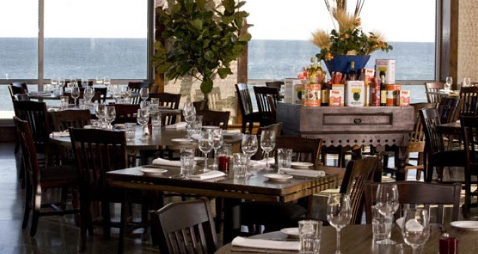 There are several along Ocean avenue, (the road that runs along the boardwalk), as well as a bigger lot on the south end by Stella Marina, which usually charge around $5.00 for the day, which saves you the worry about having to run back to the meter, etc. 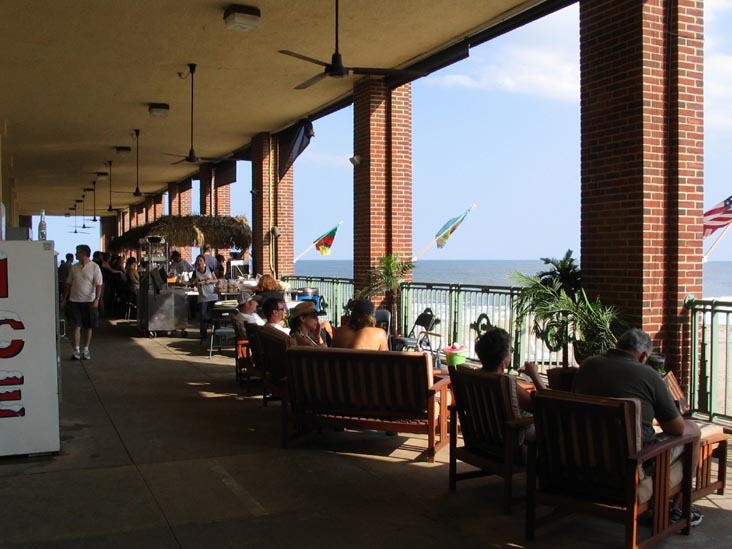 then walk up to the boardwalk to grab a bite to eat, shop, play pinball, or rent a bike for the day to cruise along the waterfront, then catch some live music at night at one of the city’s famous clubs. 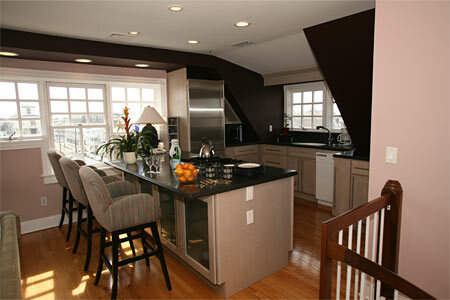 Here are some places we found to be exceptional in their service-enjoy! Fun for the whole family, they have the original KISS and ROLLING STONES Pinball machines from the 70’s! Stop by the OBMC for a special $2.00 off pass for up to 4 people for the hour. (You can buy an hours time of unlimited play on any machine you want, or an all day pass). 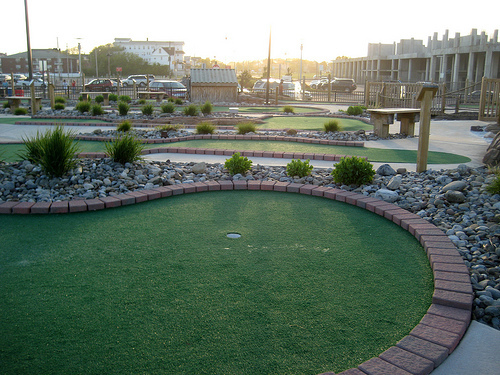 And also a miniature golf course! 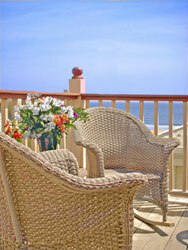 They also have outdoor patio seating and an upstairs deck with amazing views right on the ocean. 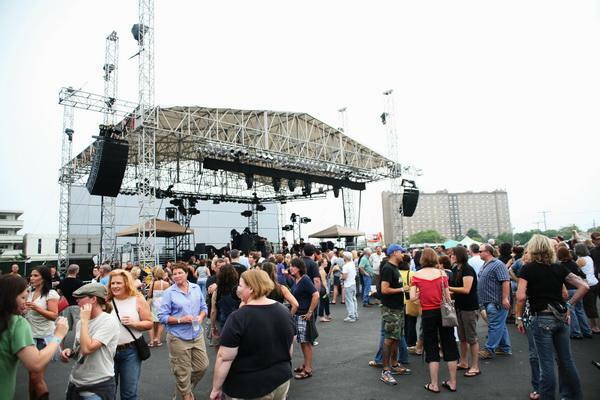 For those of who love live music, did you know that Asbury Park was named one of the Top 10 places for live music in the United States? 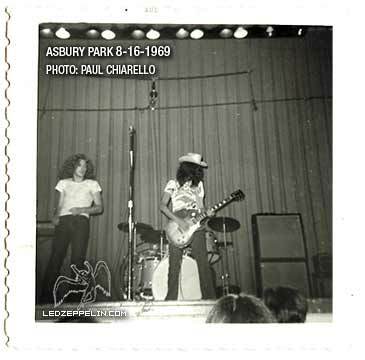 Many have heard of the legendary tales of inspiration from Bruce Springsteen and others who grew up on “The Circuit”, but also many legendary bands and artists have also played in Asbury over the years. The Rolling Stones, Tickets starting at $3.00! The Doors at Convention Hall! 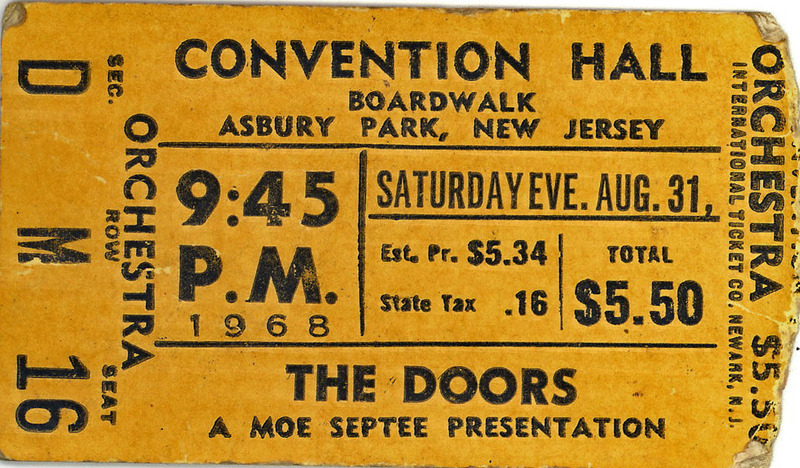 August 31st, 1968- $5.50! 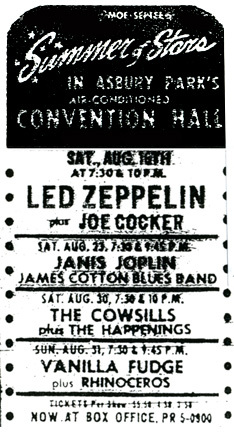 Unbelievable, Led Zeppelin at Convention Hall, August 16th, 1969. 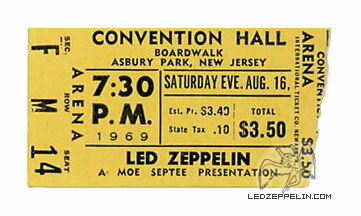 Read more about this legendary show here, where Zeppelin turned down Woodstock to play Asbury Park Convention Hall for two nights! And from The Sunshine Inn, check this ad out! 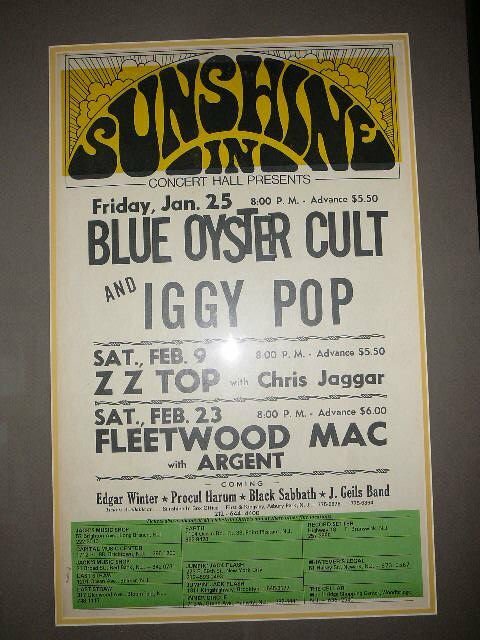 Blue Oyster Cult, Iggy, ZZ Top, Fleetwood Mac, Argent and others, with “Upcoming” Shows featuring Black Sabbath with Cactus and Bruce Springsteen in Steel Mill opening up, November 27th, 1970! Other favorite legends of ours also played there in the beginning of their careers, KISS in November of 1974, and Uriah Heep in June of 1972. 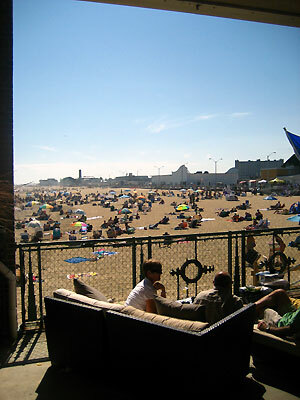 All in a month in a small Asbury Park on the corner of Kingsley and First Avenue. 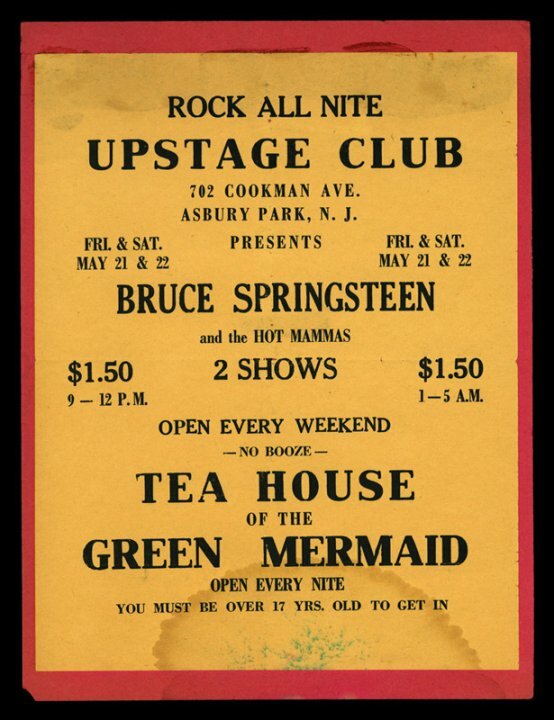 Bruce Springsteen at the legendary Upstage on Cookman Avenue, playing two sets, for $1.50! 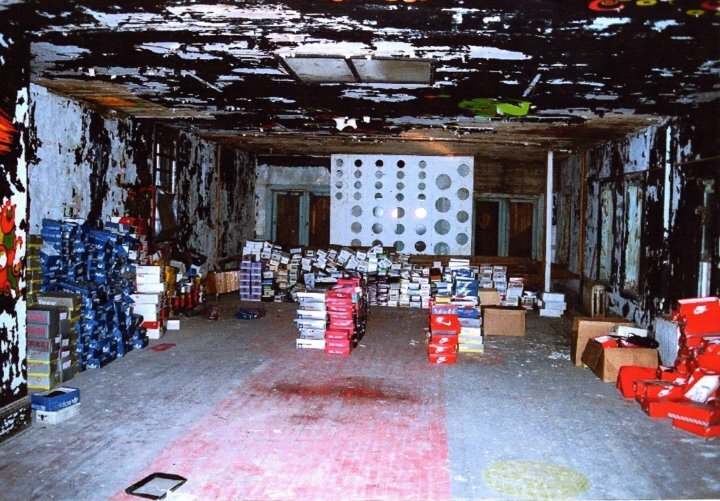 Inside of the Upstage later when it was a shoe store, where legends were born- amazing! 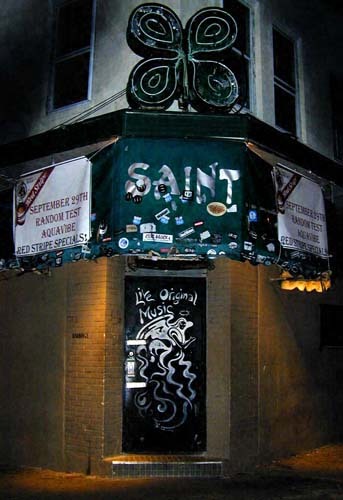 While we must confess that we believe that there will never be the same caliber of amazing bands or artist’s from the 70’s on the circuit again, you can still catch some great music from up and coming bands, legends, and everyone in between at one of the most legendary clubs in the world (!) 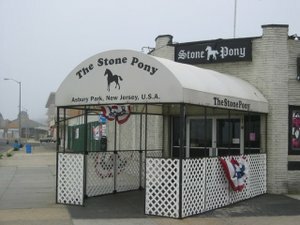 in our own back yard at Asbury’s famed music landmark, The Stone Pony. 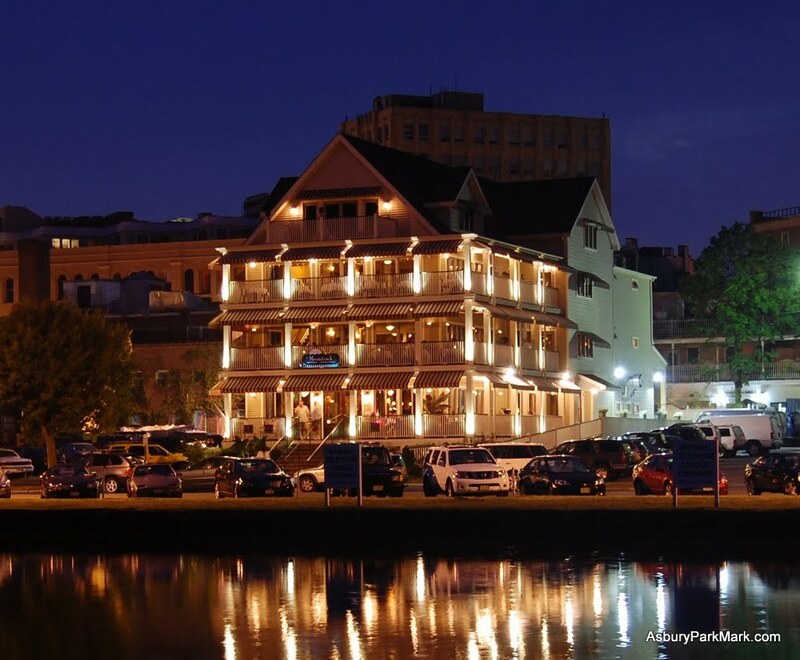 There are many other great places to go and things to do in Asbury Park, less than 40 minutes from Old Bridge, so be sure to add this wonderful jewel on the Jersey shore on the list of places to go for summer fun! 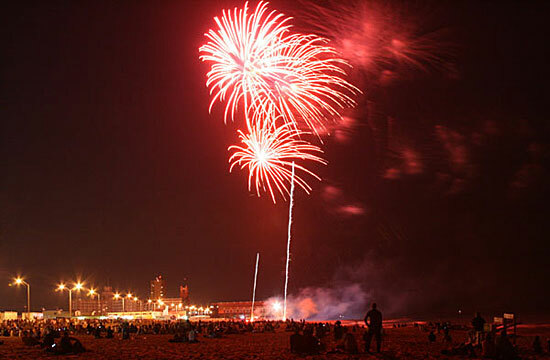 And don’t forget, there are Free Fireworks, every Wednesday night on the beach! 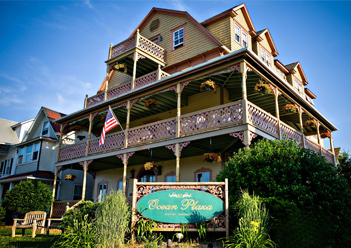 Next, Ocean Grove, and the surrounding Jersey Shore towns! 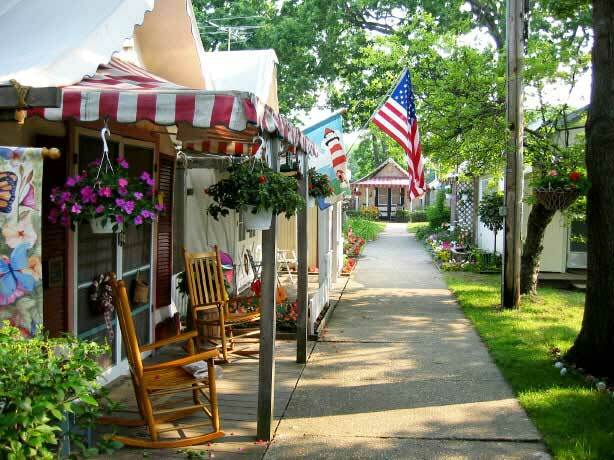 Continuing south from Asbury Park to the next town over, we are transported to another place in time when entering the historic seaside town of Ocean Grove. 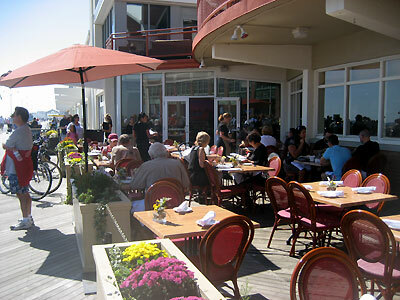 Whereas Asbury is a diverse combination of older legendary architecture, people, places, and local flavor, mixed with “Hip” “Trendy” places to dine and shop, 5 star restaurants, award winning beaches, tons of live entertainment, excitement, things to do,it has quickly become the place to be on the Jersey shore for a different type of summer experience for the family. Ocean Grove on the other side is a step back in time, (in a nice way), where after passing through the gates welcoming you to the square mile oasis, you enter Main Street, and the splendor of the Antique Victorian homes, small shops, cafes, ice cream parlors, local hardware and general stores, and begin to feel that somewhere the clock stopped in 1952. 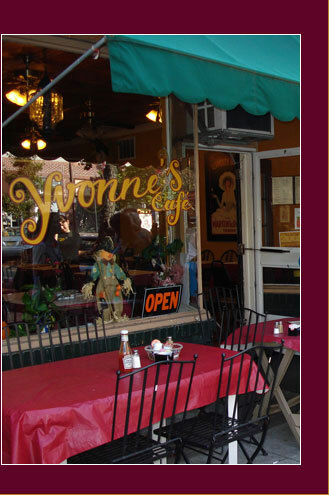 For those of you who like to shop, there are a handful of local antique shops, and along the way you can stop for a bite to eat at small cafe’s like Yvonne’s on Main Street. 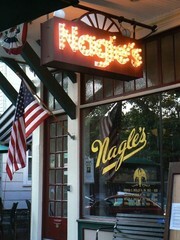 Walking across Main Street, you will find one of the oldest ice cream parlors and old time food cafe’s, Nagle’s, which has been a landmark since the 1800’s! 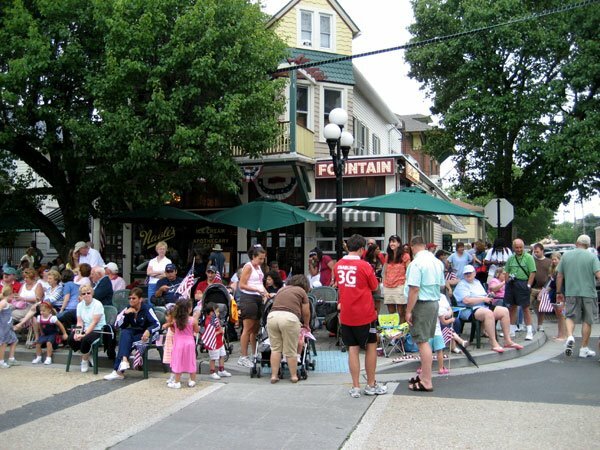 You can stop and get a bite to eat, or order some old fashioned ice cream through the window outside, and grab a seat outside and take in the 1950’s family atmosphere that is unique to Ocean Grove. 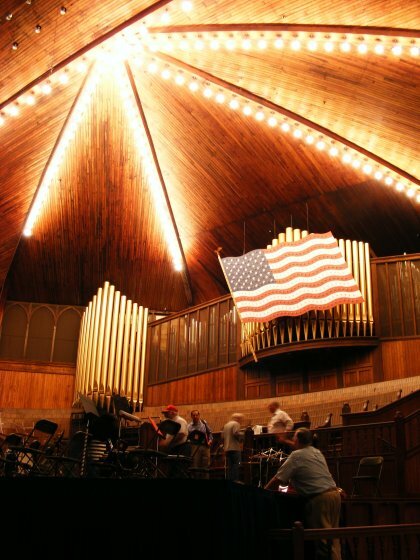 There are many more small shops and places to eat around town, but be sure to try and make it to a concert right down the street of Pilgrim Pathway at the crown jewel of Ocean Grove, the Great Auditorium! 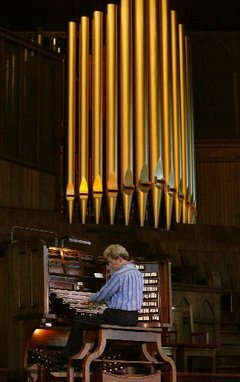 Aside from being an amazing place to visit on its own merit, we are also lucky enough to have one of the country’s top organist’s in our own backyard, performing free organ recitals many times throughout the summer! 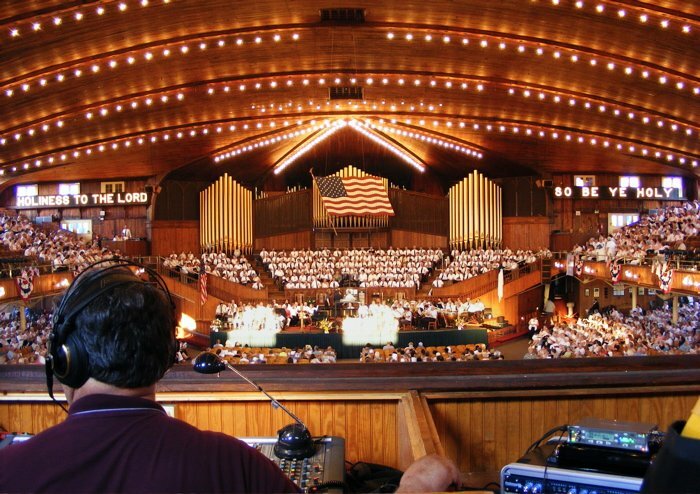 Be sure to check out Gordon Turk, and catch a true master of the pipe organ, a must see! 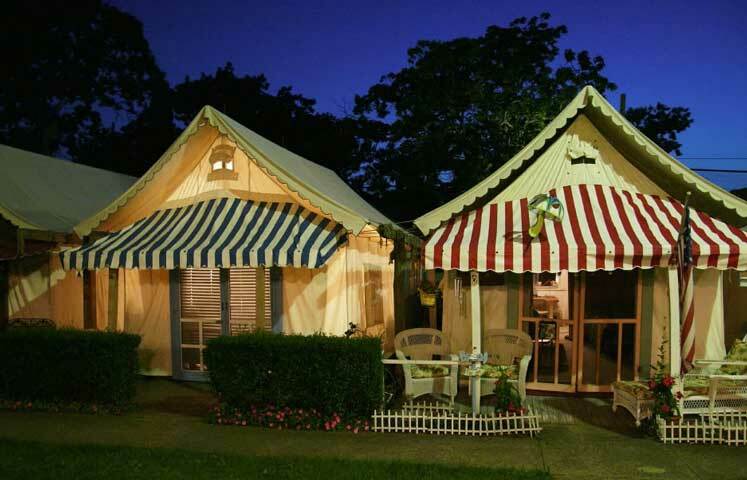 While walking around the Great Auditorium, be sure to take a leisurely stroll through one of our favorite places on earth, the Tent Colony of Ocean Grove! And check out these pictures of the Tent Colony-Awesome! 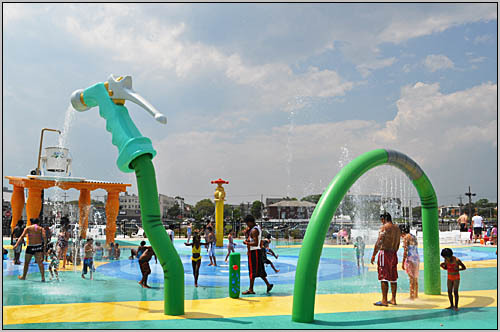 Well, that is about it for now, we hope that you found this guide a little helpful in planning some family activities, or getting away yourself to experience some of the greatest things the Asbury Park/Ocean Grove area of the Jersey Shore has to offer.